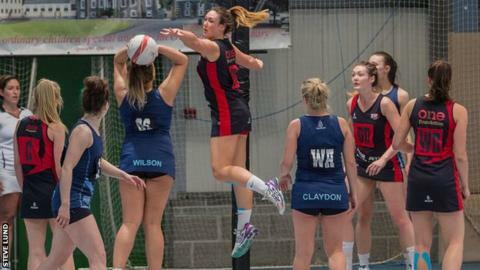 Jersey's Team Jets netball team are 'not scared' about the prospect of playing in Premier League Two, according to head coach Linda Andrews. The island side were promoted via last season's play-offs as they continue to rise up the national league structure. "The main thing this year is we're not scared," Andrews told BBC Radio Jersey. "Last year we were scared and we were worried thinking it would be a step up, this year we're not, we're just going to relish it and play our hardest." The island side begin their campaign with a home game against Norwich-based club Thoroughbreds, having have won three promotions in the past four seasons. "We haven't played since May, which is an awfully long time, so we're just itching to get going and meet all this new opposition," Andrews added. "We had a big break because the girls were physically and mentally exhausted, so we had six to eight weeks off. "Then we put a new plan into place with new strength and conditioning and new technical work so they've been back in and working very hard. "You've got to be really savvy and you've got to be thinking all the time. A lot of things we've worked on are thinking drills and how to react to certain situations."